Environmentally safe and economically smart. Every day, that great big ball of nuclear reaction in the sky that we call the Sun graciously sends enough energy to Earth to fulfill all of our power needs ten times over. Sadly, we humans are not yet able to harness all this power as efficiently as other organisms on our planet. While we have a long way to go before we can even begin to compete with photosynthesis, we are making progress. A new study by the National Renewable Energy Laboratory (NREL) suggests that 25 percent of the United States’ energy needs could be filled by rooftop solar installations alone. Not every rooftop is ideal for solar paneling, and a combination of many factors determine how much electricity any given rooftop can generate. These factors include average sunlight of the area, as well as how much of that sunlight is allowed to reach the roof, uninhibited by pesky tall buildings, trees, or other shade-throwing structures. 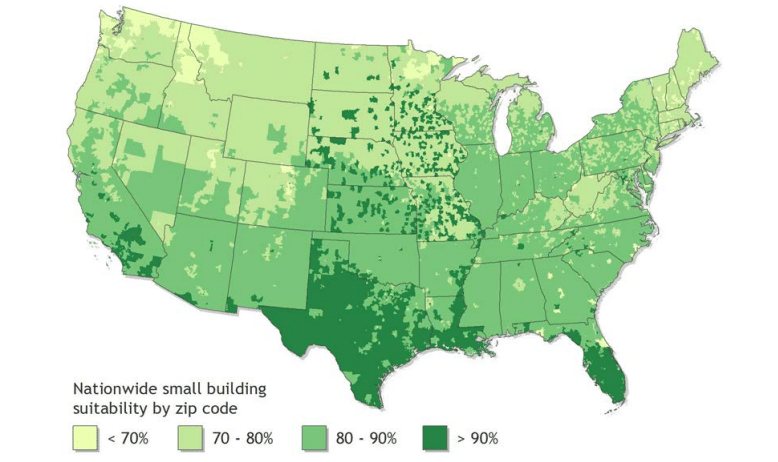 Using this knowledge, the researchers at NREL studied a plethora of data to determine what percentage of rooftops would prove suitable for solar electricity generation. The study concluded that the U.S.’s suitable rooftops could collectively generate 1,118 gigawatts (GW) of power, enough to meet a quarter of our needs. Currently in the U.S., solar power accounts for much less than one percent of total energy consumed. A few other renewable sources such as wind, geothermal, and hydroelectricity account for only a sliver more of our total clean energy consumption. Despite progress in clean energy solutions, more than 81 percent of the energy needs of the country are still met by climate-damaging non-renewable sources. Recently, there has been a push to promote solar energy usage, particularly as an alternative to coal. The technology necessary to harness solar power is becoming much cheaper, which is going to make shifting from these dangerous fossil fuels to clean energy alternatives not only smart in terms of the environment, but also our wallets.